Process Overview The SharperTek AMT2000-30G4T-DEB is a robotically operated, three tank, industrial parts washer and deburr machine designed to process two parts at a time. It is ideal for washing oddly shaped metal and magnesium parts. Ultrasonic action & cavitation jets effectively remove oils, dirt, & chips remaining from manufacturing processes. The robots 6 degree-of-freedom motion can present each part feature to the cavitation jet to ensure total cleanliness in all hard to reach areas. The machine can process up to 6 parts an hour. Parts fit into a working space of 36� x 24� x 18� DIMS. A key feature is the system�s ability to keep the parts submerged while simultaneously cleaning with water, cavitation jets, and ultrasonics. This results in the best possible cleaning of complex-shaped parts by penetrating deep into every hole. A pump and filtration system recirculates the fluid within the tank during the cleaning cycle to remove debris. The draining process fully purges the cleaning chamber every cycle, flushing soils and chips from the parts and process chamber, allowing even the most complex parts to be effectively cleaned. During the final rinse portion of the cycle, the particle counter checks the quantity and size of particles still being removed from the part to ensure requirements are surpassed. The attached air knife dryer and vacuum chamber ensure all liquid has been blown off or evaporated, leaving a clean dry part. Years of SharperTek innovation and development have resulted in proven, simple, rugged designs and construction elements that provide continuous reliable operation. The unique combination of robotic motion and cavitation jets remove any particulate on the surface or in blind holes. The cavitation nozzle permits effective cleaning at dramatically lower flow rates, lower temperature, and without chemical cleaning agents. The robot is programmed to present every surface and hole on the part to one of the high pressure cavitation jets which loosen any debris on the surface. The robot does not just place a hole in front of the jets but moves the part back and forth so that pressure pulses drag any debris out of the hole. Meanwhile, the ultrasonics continuously blast the part with vibrations to remove macro and microscopic particles. This ensures even the smallest pieces of debris are consistently removed. Soiled water in the wash tank overflows into the weir tank then back into the storage tank. The storage tank is continuously churned with eductors, so there is no place for particulates to settle. Chips & particles ingested by the vertical pump. Particles are then forced through large particle strainers, then through 5 micron filter elements before being delivered back to the wash tank via cavitation nozzles. The nozzles only ever spray the part with filtered water. The system includes an optical particle counter with a sensitivity range from 0.2 micron to 125 micron�larger particles are counted as 125 micron. The counter measures an apparent optical size of a particle as it passes in front of a laser, then reports a histogram of apparent size ranges. Each bar of the histogram is the number of particles counted in that range during a sampling time. During testing at SharperTek, a correlation between apparent optical size and actual particle mass will be established. This allows us to determine the cleanliness of the fluid coming off the part at any time. Testing will also determine what level of fluid cleanliness correlates to empirical part cleanliness. This way during operation, by measuring fluid cleanliness we validate the part cleanliness specification. An exceptionally dirty part can be run multiple times through the washing phase until the fluid cleanliness threshold is met. An administrator can reprogram the histogram bins and process parameters from the HMI if alternative cleanliness specs or part geometries are encountered over the life of the system. The wash tank rapidly drains into the storage tank. With the wash tank empty, the nozzles begin rinsing the part again with filtered water. The robot repeats the cleaning motion to rinse any remaining debris off all surfaces and holes and excess liquid drains back to the storage tank. During the end of the rinse cycle, the particle counter collects a sample to check how clean the part is. The air knives are located above the process tank. Water that is blasted off the part will fall into the wash tank. The air knives use cool nitrogen to displace atmospheric oxygen in the enclosure. After blowoff the part can be released to the staging area and picked up on the opposite face if necessary for air knives to access opposite face. Clever design of EOAT should obviate this step. If the part is massive enough it will hold enough heat at ambient temperature to vaporize remaining water during vacuum drying. If not, then undesirable ice crystals may form. This shows the advantage of blowoff�to minimize water on part. The design will include optional warming plates in the staging area, if the part must be warmed before the vacuum phase. After staging, robot docks with already dried part in vacuum chamber and returns it to the parts nest or conveyor. Next, robot docks with staged part and releases it into the vacuum chamber. When robot signals it is clear, vacuum lid closes. The scroll pump drops the chamber to a rough vacuum forcing lid tight against oring seal. At room temperature water vaporizes and is pumped out of the chamber. A dual vacuum chamber is an option to reduce process time. 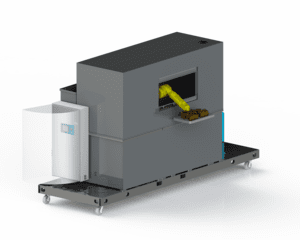 With the separate washing and drying tanks, the machine is capable of processing 2 parts simultaneously; one part in the cleaning tank while another cleaned part in the vacuum chamber dries. When the cleaning is completed, the robot quickly removes the dried part and loads the damp clean part into the vacuum tank and then starts the cleaning process on a new part. This process continuously maintains a 2 part cleaning cycle, doubling throughput. The wash tank bottom is sloped from three sides for 100% quick drainage and chip removal. These chips and other debris drop into the storage tank, which also has a sloped bottom. Chips and particles are maintained in suspension by eductors. Suspended solids are ingested by a vertical pump, which rapidly turns over the fluid volume. The pump discharges through dual strainers and filters. Each strainer-filter set can be isolated so that an operator can dump the strainer basket or change the filter element while the system is online. Pressure gages on the filter housing visually indicate to the operator when a filter element needs changing. However, they should also be changed on a PM schedule, or to troubleshoot cleaning performance. As magnesium is less reactive in low temperature water, a chilling system constantly cools the water in the storage tank to 50�F. This will not only remove any heat that was added during the pumping or cleaning portions but also keeps the fluid well below room temperature. A temperature sensor in the storage tank monitors this process. Additionally, a conductivity sensor in the storage tank monitors the PPM of dissolved magnesium in the solution. In the case that the water is too warm or conductive, a warning message on the control panel is activated and the cleaning process will halt until the water returns to appropriate operating conditions. At low temperatures the production of hydrogen should be trivial. However, if the hydrogen reaction proceeds for some reason, a roof mounted ventilation and mist collector are present to remove the hydrogen. If for some reason these systems are insufficient, a backup hydrogen sensor continuously monitors the process chamber checking for elevated hydrogen levels. At 1% Hydrogen, it activates a non-urgent warning and begins to add nitrogen to the chamber, pushing the lighter hydrogen up and out through the ventilation duct. At 2% hydrogen, an alarm sounds, operation is halted, and the nitrogen purging continues. This prevents and undesirable 4.1% hydrogen level. An ergonomically designed loading mechanism helps operators work efficiently and stress free. An operator places a parts nest outside of the process chamber window and the robot does the rest. In the case of a conveyored system, an operator is not necessary except to periodically monitor the functionality and safety of the machine. In both cases, monitoring systems stop a person from interacting with the robot. If a roll-up parts nest is used, a light screen around the docking location for the cart will temporarily halt operation if it detects a person. In a conveyored system, the conveyor is covered by a housing at the point of robot pickup, eliminating any possible contact between an operator and the robot. Operators are free to unload and load additional parts nests or work on other tasks while the AMT2000-115G4T-DEBURR cleans the parts. Easy loading and unloading speeds cleaning and reduces operator stress. The robot is IP67 rated. This means it can withstand being submerged in water 1 meter deep for 1 minute. No part of the robot will be submerged or placed in front of a nozzle. The EOAT extends beyond the robot wrist and will be submerged.